Once again the Calvin Institute of Christian Worship has spread a banquet feast of inspiration at the annual Worship Symposium (annual! hard to imagine how they do this every year). I had the joy on Thursday of hosting a conversation between Makoto Fujimura and Bruce Herman, two artists engaged in “culture care,” a commitment to promoting the work of healing culture through art-making. Here are some highlights from their conversation. Collaboration invites artists to go deeper. The starting point of the session was Bruce and Mako’s collaboration on a project called Qu4rtets, in which the two painters worked together to create paintings in response to T. S. Eliot’s great poem The Four Quartets. Thanks to the generous support of patron Walter Hansen, the project engaged the two visual artists as well as composer Christopher Theofanidis and theologian Jeremy Begbie. Theofanidis, who composed a string quintet reflecting on the poem and the paintings, remarked that working together enabled them to go “as deep as we’ve gone” as artists. Art is a healthy and powerful way to respond to trauma. Both Mako and Bruce were drawn (separately) to Eliot’s poem through experiences of trauma in their own lives. Bruce’s home burned down in 1997, destroying twenty years of his work. Mako was present near Ground Zero on 9/11. Because Eliot’s poem laments the traumas of the early twentieth century, most especially two world wars, both artists have found solace for many years in Eliot’s words, which invite us to dwell deeply in grief and faith at once. It became clear that trauma, both personal and public, weighed heavily on the people gathered in the room Thursday and within the churches we all represent. Yet we feel ill-equipped to hold these experiences with tenderness. We often do not know how to give grief and lament the space and time they require. However, painting, sculpture, music, dance and other forms can express unutterable emotion, create space for reflection, and provide healing. Art can help us do the “Holy Saturday” work of acknowledging the darkness, opening a space to respond with and beyond words. Failure is at the heart of the creative process—and at the heart of the Gospel. The creative process inevitably involves failure, so that “fail better next time” has become a standard encouragement. Bruce suggested that there’s a theological dimension to this, a kind of dying and rising. “There’s a place in the creative process when you have to demolish and betray in order to make the piece come alive,” he observed. He went on to compare this to the stage in farming that requires breaking up the soil to prepare for growth. The topics of violence and betrayal came up because Mako was involved as a consultant in the making of the recently released film Silence, directed by Martin Scorsese and based on the 1966 novel by Shusaku Endo. The novel, written out of the aftermath of Hiroshima and Nagasaki, looks back into the history of Japanese trauma to the seventeenth century, a period of brutal persecution of Christians in Japan. The novel and film do not focus on heroic Christian martyrs, but on those who failed, those who, to spare others and themselves from unspeakable tortures, apostatized and betrayed their faith. The story forces readers and viewers to grapple with the cross at the heart of Christianity as a symbol of futility and failure. “At the heart of our faith is a disaster,” remarked Mako. Christianity meets us in our failures and betrayals and offers us a crucified Lord. Art is not a luxury or an afterthought. When we turned to the subject of art in worship and in church life, Bruce and Mako both gave rousing theological defenses for making as fundamental to human nature. Bruce did a riff on Augustine: “God is a maker, we are makers, our hearts are restless till we make like thee.” Mako reflected that God created out of love (not any sort of necessity) and we, made in God’s image, are invited to co-create with God out of that same love. Churches should be leading the way in supporting the arts. In response to the news that the new president’s proposed budget includes cutting the National Endowment for the Arts, Mako urged us to think about the numbers. That’s only $300 million (for both NEA and NEH). If all churches would commit only one percent of their annual budgets to supporting art-making within their congregations, through Christian arts groups, or in other ways, the amount of money committed to art would blow that small number away. Why are we not doing this? Later I will post here a link to a conversation with Makoto Fujimura and me, recorded on January 27, for the Western Theological Seminary Luxcast. 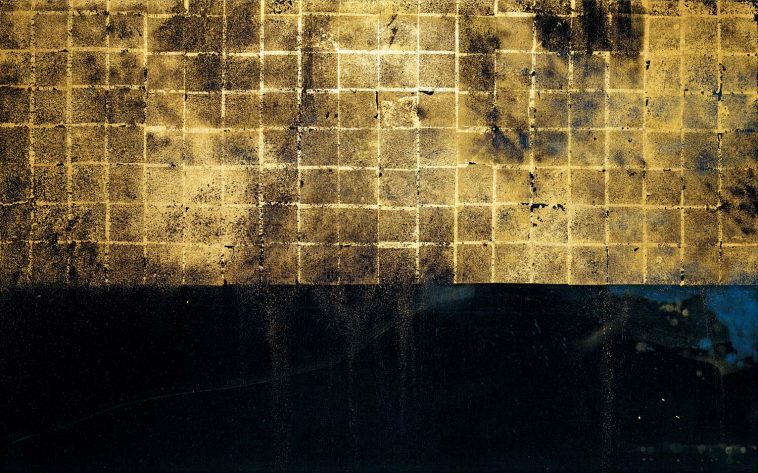 Image: Makoto Fujumura, Qu4rtets III, 2012, mineral pigments and gold on belgian linen, 127 × 203 cm.